A human’s lack of gills has not stopped them finding alternative means of breathing underwater and scuba diving provides a opportunity of exploring the most alien part of our planet. Scuba diving is swimming underwater using self-contained breathing apparatus. Unlike snorkelling or free diving, scuba diving is not hampered by the need to hold one’s breath for long periods or stay close to the natural air at the surface of the water because the diver carries a source of compressed air with them on their back. A scuba diver typically swims around with the assistance of fins attached to the feet, although there are alternative means of propulsion available including the Diver Propulsion Vehicle (DPV). Scuba diving is largely a recreational pursuit, but there are also commercial, scientific and military disciplines where participants are interested in aspects beyond marine life and don’t dive merely for the fun of it. Scuba diving is a safe recreation these days because of advancements in equipment design and reliability and the heavy safety focus of the training courses. Like any serious adventure sport, scuba diving has the potential to be deadly if not shown the right levels of respect, with divers acting beyond their training or ability. With the correct training and responsible practise it is a comparatively safe pursuit. There are reportedly only a handful of scuba diving-related fatalities each year out of a diving community of several million. Scuba diving training is not an optional choice for beginner divers, it is an essential requirement. Diving without proper preparation is very dangerous. It is a technical sport that requires practical training in the operation of the diving apparatus as well as learning the basic theory of how the body reacts to the stresses it is put under within the water. To become a diver it is first necessary to enrol in a recognised training course that will lead to a scuba diving certificate. The four main UK agencies offering training are the British Sub-Aqua Club (BSAC), the Professional Association of Diving Instructors (PADI), the Sub-Aqua Association (SAA) and the Scottish Sub-Aqua Club (SSAC). Training is split into three main parts; pool work, theory and open water diving. Students will begin diving in a pool or sheltered shallow water, where they will be taught basic skills such as equipment use. This is supplemented with some classroom teaching, where the essentials of water pressure, diving medicine and safety are taught. Open water diving is where the student has reached a sufficient ability that are able to experience real diving in a lake or at sea. Scuba diving is open to anyone who is physically fit and in general good health. In order to make sure of this, a routine questionnaire must be first completed. Any answers that indicate a risky condition need to be followed up with a medical check up with a specialist doctor, in order to ascertain whether it would be safe to dive. It is not worth lying to pass the medical because diving puts a special kind of strain on the body and to falsify health conditions is to put the diver and fellow divers at risk. Beginner scuba divers are not expected to be especially strong swimmers but they will need to demonstrate a reasonable proficiency and ease in the water. At a standard scuba class students will be expected to be able to swim 200 metres non-stop, duck dive and tread water for 10 minutes. Scuba diving is about exploring the part of the planet where humans were not designed to go. However scuba diving is not simply a way of breathing air underwater; nature has thrown up some more difficulties to contend with. 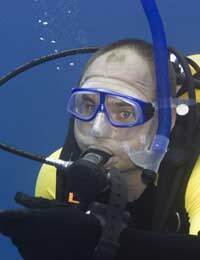 A diver has to contend with the problem of ambient pressure, which compresses the lungs and chest making it difficult to breathe, and which increases the greater the water depth. Fortunately there are demand valve regulators that can measure the ambient pressure and supply the diver with oxygen at the same pressure, enabling them to breathe. Deeper diving requires different air mixtures in the diver’s tank, because the increase in pressure causes a build up of nitrogen in the blood stream and can lead to nitrogen narcosis or the bends. Normal air is comprised of 78% nitrogen and so specially modified gases typically reduce its content.